Important: The content on this page applies only for Amazon Fire TV (Gen 2) devices. For more general information about 4K video on Fire TV, see 4K Ultra HD Specifications on Fire TV. Amazon Fire TV (Gen 2) operates at 1080p at 60 FPS mode even when connected to a 4K UHD TV. To play 4K UHD content, you must switch the TV to 4K UHD display mode. This switch between HDMI display modes (triggered by the app when it needs to play 4K UHD content) is called HDMI Mode switch. Google introduced 4K Display.Mode APIs in Android Marshmallow. Display.Mode allows applications to query physical display sizes and switch to a different HDMI display mode. For Fire OS 6, which is built on Android Nougat, these Display.Mode APIs are readily available to use. For Fire TV devices running Fire OS 5 (based on Lollipop, before Display.Mode was released), Amazon implemented the Display.Mode APIs. As a result, your app can use these Display.Mode APIs even on Fire OS 5 for the HDMI Mode switch. Since these APIs are not part of Android API Level 21 (Lollipop), apps must use "reflection" to access the APIs. Alternatively, app developers can use the 4K Extension Library developed by Amazon, which wraps these Android APIs via reflection and provides a simple interface for them. You can also display an optional interstitial developed by Amazon to prepare customers for the HDMI Mode switch. This interstitial is distributed as part of the Amazon Extension Library For 4K. Fire OS will also provide a sys.display-size system property to report the maximum supported resolution of the connected display. Query supported display modes with Display.getSupportedModes(). Display.getSupportedModes() returns an array of Display.Mode objects. This synchronous API returns the modes (resolution and frame rate) supported by both Amazon Fire TV (Gen 2) and the attached display. If the attached display supports 4K UHD, then 4K UHD modes will be included in the list. Because frame rate conversion may not provide optimal results, Amazon recommends switching to the actual or closest frame rate of the content to be played (4K at 24fps, 4K at 25fps, or 4K at 30fps). Retrieve the current display resolution and frame rate using Display.getMode(). Display.getMode() returns the current display resolution and refresh rate in a Display.Mode object. Set the Display mode with the WindowManager.LayoutParams.preferredDisplayModeId property. A mode switch will not be initiated during Activity transitions if both activities prefer the same mode. System and voice overlays will not initiate a mode switch. The display switches back to Full HD (1080p) resolution when either the application or activity terminates. The Display.Mode class definition aligns with Android Marshmallow. Get notification for when the mode switch negotiation is complete. Through the onDisplayChanged(int displayId) method, you can be notified when the mode switch negotiation is complete. DisplayManager.DisplayListener sends a callback when properties of logical display have changed. This callback will be received once the mode change is complete. Note that the displayed content may not be visible for a few seconds after the callback is received. The approach using the 4K Extension Library is covered in the next section. HDMI Mode Switch APIs in Amazon Fire TV (Gen 2) are not available in Android Lollipop SDK. To use them, you must use reflection. Amazon built the 4K Extension Library (provided in the form of source code) to demonstrate how to use the Android APIs and provide a helper class. The extension ZIP file includes a sample app inside the Test folder called "DisplayModeCheckSample." There's also a Javadoc file, which you can view by expanding the doc > javadoc folder and opening the index.html file. When you switch modes, the interstitial appears (on an Ultra HD TV) and the app switches to 4K Ultra HD mode. Amazon’s 4K Extension Library contains the classes listed in the following sections. In addition, it includes the API for displaying the "Amazon Interstitial" to prepare customers for the HDMI Mode switch on Amazon 4K devices. The following sections describe these classes. 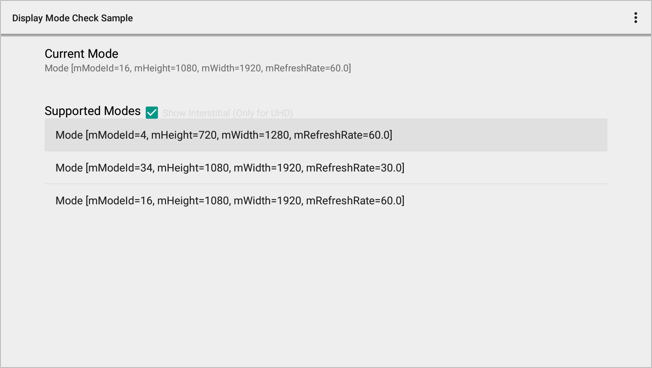 This method lets you request a specific display mode (resolution and refresh rate). This method initiates a mode switch on the supported devices if the display is not currently set at the requested mode. UhdHelperListener is used to notify the application that the mode switch HDMI negotiation is complete. targetWindow Window to use for setting the display and call parameters. modeId The desired mode to switch to. Must be a valid mode supported by the platform. allowOverlayDisplay Flag request to allow display overlay on applicable device. Note that mode switch requests might not be successful, and you must verify the mode from UHDHelperListener#onModeChanged(Display.Mode mode) or call getMode(). You must wait until the mode switch is complete before starting content playback. Also, the mode switch works only with Amazon Fire TV (Gen 2)." Determines all the supported modes on the connected device. An array of Mode objects or NULL if an error occurred. Returns the current mode that the display is set to. This method is also used to determine the success of a mode switch. When a mode switch is in progress, the result of getMode() is undefined. Mode that is currently set on the system or NULL if an error occurred. The UhdHelperListener class provides the onModeChanged(Display.Mode mode) method. This method is used to inform applications when the mode switch HDMI negotiation is complete. It also provides the current mode (which could be the requested mode) if the mode change was successful. mode The Mode object containing the mode switched to, or NULL if there was a timeout or internal error while changing the mode. The Display.Mode class mirrors the Display.Mode class in Android Marshmallow. This is used to describe a display mode’s resolution and refresh rate. Because the customer experience is interrupted during an HDMI Mode switch, Amazon has built an interstitial that can be optionally displayed to prepare customers before the HDMI Mode switch. The code to trigger this interstitial is available with the Amazon Extension Library For 4K. with allowOverlayDisplay set to true. The overlay will be shown for two seconds prior to the start of the mode switch.